What is the scope of hotel management in India? What are the hotel management subjects? How is hotel management degree different from an International diploma in hotel management? – These are the common questions that ring in young minds who are contemplating a future in the hospitality industry. Today to be able to do what you love and make a career out of it is the new generation’s thinking. 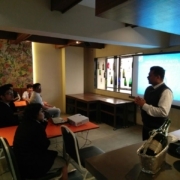 In pursuit of the right career, the students of Bright Day School along with their counselor visited the Jindal School of Hotel Management for awareness of hospitality management degree courses. It is the skill levels of the students that determine, which is the Top Hotel Management colleges in India. 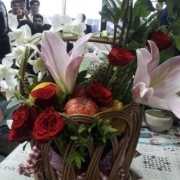 JSHM, Vadodara organized a hands-on flower arrangement demonstration for the students of BBA Hospitality Management and the batch of Diploma in Hotel Management. The flower arrangement techniques are a much-needed skill for any Hospitality Graduate. Its contribution towards a positive guest experience cannot be overlooked. Mr. Khan; Chief Florist at The Grand Mercure Surya Palace Vadodara was the expert invited to conduct this session. The Students of Diploma in Hotel Management assisted Mr. Khan during the demonstration. Later, the students of BBA Hotel Management tried to replicate the magic created by Mr. Khan. The participants enjoyed the exposure to this wide array of floral arrangements. Ms. Saroni Sarkar, our H.O.D for the Room Division, explained the practical use of these arrangements in the day-to-day operations of a hotel. Our claim to be one of the top hotel management colleges in India got an unexpected boost this November. JSHM’s Alumni, Jigar Tikkiwala made us proud at the at the Salon Culinaire 2017. 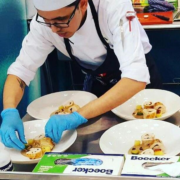 He represented The Ritz Carlton, Doha Qatar at the Salon Culinaire 2017 Doha and finished top three in this year’s competition. 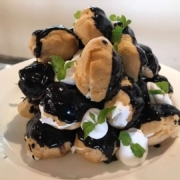 Student of BBA Hospitality Management, Jigar completed his Hospitality Management Degree in the year 2015. He originally hails from Surat. After completion of his internship from Grand Hyatt Mumbai and his degree, he went to the United States under J1 visa program. He got the crucial international exposure in the US and later shifted to Doha working with one of the best hotels in the world The Ritz Carlton Doha. 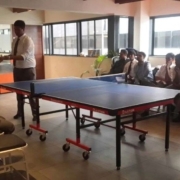 Hearty Congratulations to the following Winners & Runners up of our inter-house Table Tennis Tournament . Festival of Navratri was celebrated in all its pomp and glory through Garba Night at JSHM. Traditional music and colorful attire complemented the ambience perfectly. 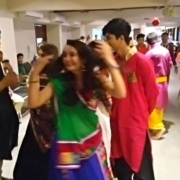 Students gyrated to both traditional songs and modern innovations like Macarena / Salsa Garba. Welcome to Jindal School of Hotel Management (JSHM), a hotel management school par excellence based in the business city of Vadodara, Gujarat. 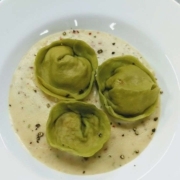 It is acknowledged as one of the best culinary colleges in Gujarat.JSHM, promoted by Jamunadevi Educational Trust, was conceived with the objective of offering international quality Hotel and Hospitality Management education in India. The affiliations of JSHM are an ideal launch pad for your career in the field of Hospitality Management. Our partnership with the prestigious César Ritz Colleges, Switzerland gives you the unique opportunity to obtain a Swiss hotel management degree. Our much coveted Hotel and Restaurant Management course enables the transfer of credits to study and work in Switzerland. Our quality of education meets stringent international and national affiliations which ensure that JSHM is rated as one of the best hotel management institutes in India, offering internationally recognized programs. 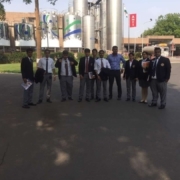 Study trip to Amul, Anand was organized for the First Year students and Chefs of JSHM on 12th June 2017. 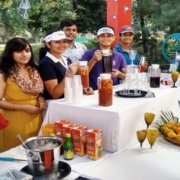 JSHM’s Mocktail counter at Vadodara Golf Club in Laxmi Vilas Palace campus on 26th Feb, 2016.